It's school holidays, what do you have in mind for lunch? How about wrapped sardines? This is simple and easy to make. 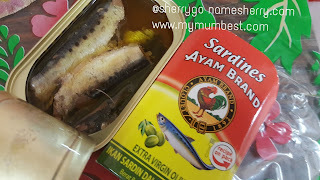 Below will consists of two recipes instead of one, but I am only using a can of Sardines Ayam Brand in olive oil. 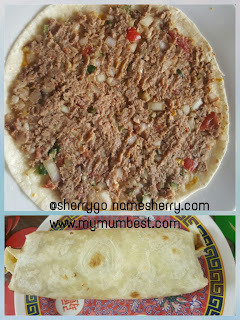 One piece of wrap, and have smashed the sardines and add on the cut onions and tomato inside. Also added Thai Chili Sauce for flavour. Wrapped it and ready to eat! One piece of wrap cut into two pieces. 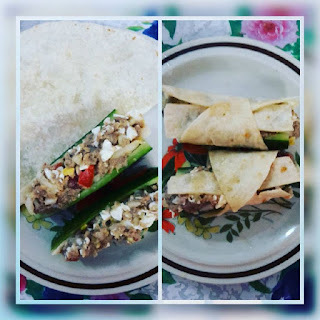 One Cucumber slide into two pieces, then add top the mashed egg and cut onions and tomato with sardines then wrap it. Yes ready to eat. Thanks for your recipe! I will definitely try this out.